Williamsburg and Greenpoint are known for their restaurants, boutiques, indie concert venues, and galleries. Bedford Avenue, the artsy main street, is a destination in Williamsburg, and Greenpoint has the incredibly vibrant Manhattan Avenue. 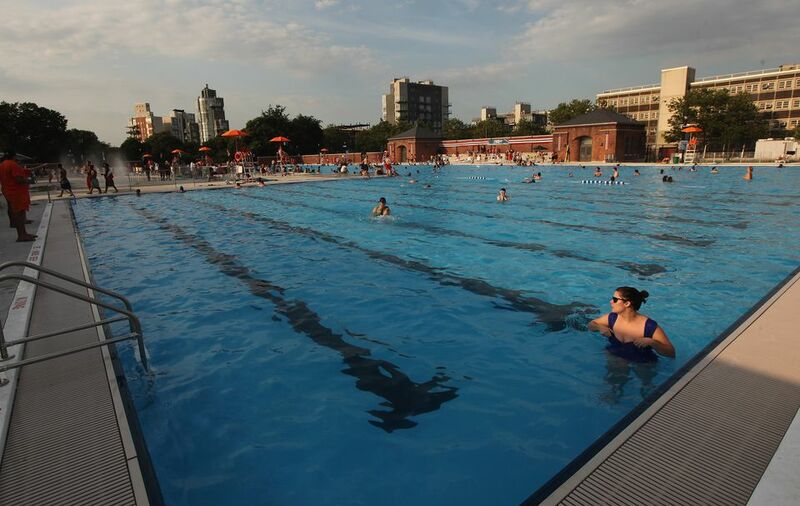 However, if you're looking to pair your visit to Brooklyn with a swim, here are fantastic seasonal and all-season pools in Williamsburg and Greenpoint. From the Metropolitan Pool indoor pool to the restored McCarren Park pool, there are many places to swim. This recreation center off Bedford Avenue boasts an indoor pool for exercise or fun. The Metropolitan Pool is a great option for Williamsburg residents who like to swim for a workout. The pool and locker rooms are clean, but it can be tricky finding a time when the lanes aren't crowded. They get particularly crazy on the weekends. Go during the day or in the early morning hours. The lanes are organized by speed: fast, medium, or slow. As with all NYC public pools, make sure to bring a swim cap, which is mandatory, and your own combination lock to safeguard your belongings. Flip-flops are also a good idea. For more serious exercisers, you will want to join a gym with more equipment. The draw to this NYC Recreation center is definitely the pool. Take the old-school approach and head to this local public pool, (it's free!) which reopened in 2012. This seasonal public pool is open in the summer months. The pool is a part of Brooklyn history. "McCarren Pool was one of eleven pools opened by Robert Moses in 1936. The pool closed in 1984 and sat unused until the summer of 2005 when the empty pool basin opened as a popular venue for concerts, dance, and movies." Check out the restored bathhouse and arch when you enter the facility. Don't forget to bring a lock to secure your belongings in their lockers. If you're looking for a hipster pool, you should pay for a day or evening swim at the McCarren Pool at the McCarren Hotel and Pool in Williamsburg. You can purchase passes beforehand or at the door. They also offer a party package, if you're planning on bringing friends. Or if you don't want to shell out the cash, you can go to the public pool in Williamsburg. Either way, you get to cool off in the water and enjoy a day at the pool. The Vale Pool, a rooftop pool at the new William Vale in the heart of Williamsburg has the longest hotel pool in New York City. The 60-foot pool is a great place to swim. If you don't want to take a dip, you can soak in the rays and the atmosphere while listening to the tunes from the DJ. In addition to coming off during the summer months in the pool, you can also take in the stellar views of Manhattan. Indulge with a poolside drink and enjoy a lazy and rather hip day at this new pool. If you're a member of the YMCA, take a dip in the pool at the YMCA Greenpoint or purchase a guest pass. Check out the schedule for the pool on their website. The YMCA also teaches swimming classes and water aerobics. The indoor pool is popular with locals and is located on Meserole Avenue.